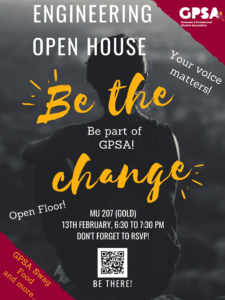 The Graduate and Professional Student Association’s (GPSA) Engineering Committee is holding an Open House to discuss key issues encountered by graduate engineering students and the initiatives to make graduate student experience better. There will be an open floor to discuss key issues and lots of information on the resources GPSA offers. Food will be available!